Includes: Bone shirt with front vest, jacet, pants, belt 3/4 length bone arms/gloves, mask and hat. Pirates are known for their sea adventures and treasure hunts. Pirates might be cunning and selfish but they will always keep their word. Our deck is full of fearless pirate costumes and you can pick anyone. Men always search for unique and expressive costumes. Everybody loves a nicely dressed man. But Halloween is not about nice clothes. What do you say? 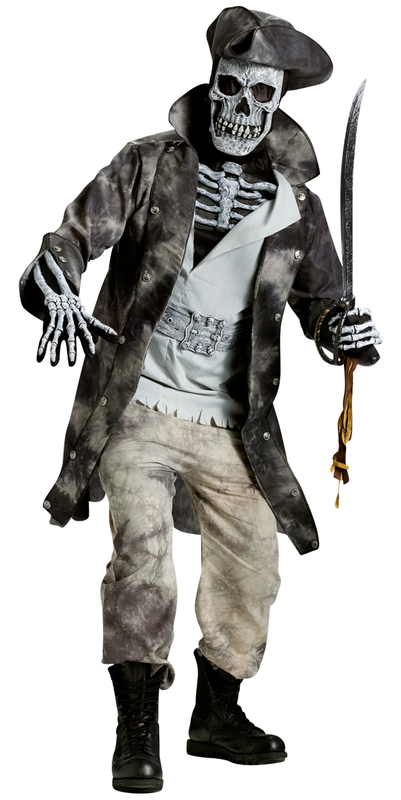 Travel to a new world of your imaginations with Ghost Pirate Adult costume.